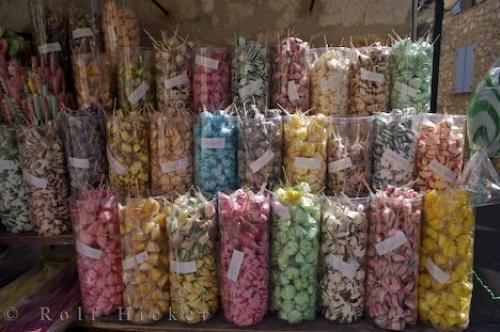 The candy store in the village of Gourdon in the Provence, France in Europe has a variety of flavorful candy for sale. The unique village of Gourdon in France, Europe has a mix of charming stores where you find gifts unlike any others. The candy store is a great place to take care of your sweet tooth where you will find an overwhelming display of candy that appeals to everyone.Sweets at a candy store in the village of Gourdon, Alpes Maritimes, Provence, France, Europe. Photo of an assortment of candies on display at the candy store in Gourdon, France in Europe.